Buddhism is one of those things, like travel and culture, that you can read all the books you want about it (believe me I have read many) but the only way you really learn is through practical experience. Buddhism is not so much a religion, but a philosophy – a way of living. There are many precepts and concepts and theories and scriptures, but essentially the real beauty of Buddhism shows itself when you try to apply what you have learned from pages in a book to your daily routines, interactions, relationships, work and outlook. Trying to explain Buddhism to other people is a very difficult task. There are many people who are closed minded, hold prejudices against religion, don’t know anything at all, make judgements too quickly, or worst yet, they think they already know it all. But nobody is really right or wrong and certainly nobody knows everything. Even during my research for this post, I have learned new things, and I have already been practising for a few years now. So I shall start at the beginning, with what the 8 Fold Path is, and over the next few posts I’ll explain more about each of the principles and how you can constructively apply them to your (minimalist) life. 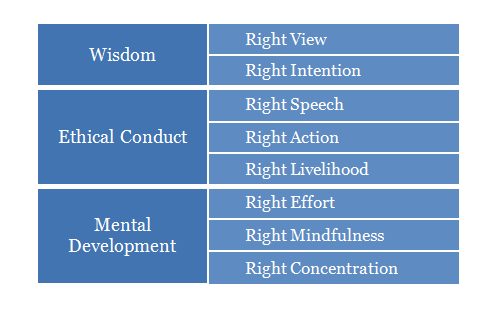 The Eightfold Path is a pragmatic guideline which was taught by the Buddha Siddhartha Gautama himself to show people how they can develop their ethical and moral conduct, gain wisdom and eventually liberate themselves from suffering. 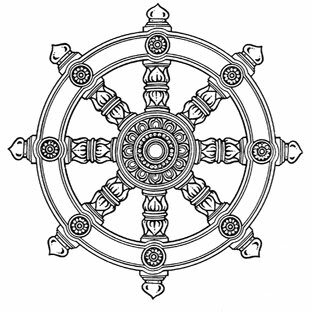 If you look at the Dharma wheel, it has eight spokes, which represent the eight aspects of the path. They all begin with ‘Right ____’ to show that there is some way to act and think in every situation that would reduce suffering towards ourselves and others. They are not ordered steps that you follow until you’ve ‘mastered’ one before moving onto the next, instead, they are all deeply interrelated and good practice involves being mindful of all of them at the same time, as much as you can. The Four Noble Truths lays out that the origin of suffering is attachment, and that the way to release oneself from suffering is to follow a path that leads away from all of the delusions of what is and isn’t real and truly important. When you begin to apply this new way of thinking into your life, there is every chance that you will make mistakes. Or, bad things might happen and people will wear on your patience. These are the times when you and your practice will be tested. But if you take them as opportunities to learn from, through a trial and error, in the end you will gain a much deeper understanding of yourself and the way the world works – which coincidentally, is something close to enlightenment. What has the Eightfold Path have to do with minimalism? As it turns out, everything. In the next post, I will talk about how to attain (at least a little) wisdom, with the Right View and Right Intention. Then, I’ll move onto the other principles under Ethical Conduct, which will be about acting considerately towards others, and Mental Development which is about cultivating a strong state of mind, free from illusions. The Eightfold Path is exactly what it says – a path, what you learn on the journey is so much more important than the destination. If you are patient and persistent with your practice, trust me, eventually you will find your way. Find me on twitter for daily doses of minimalist motivation and immediate post updates! 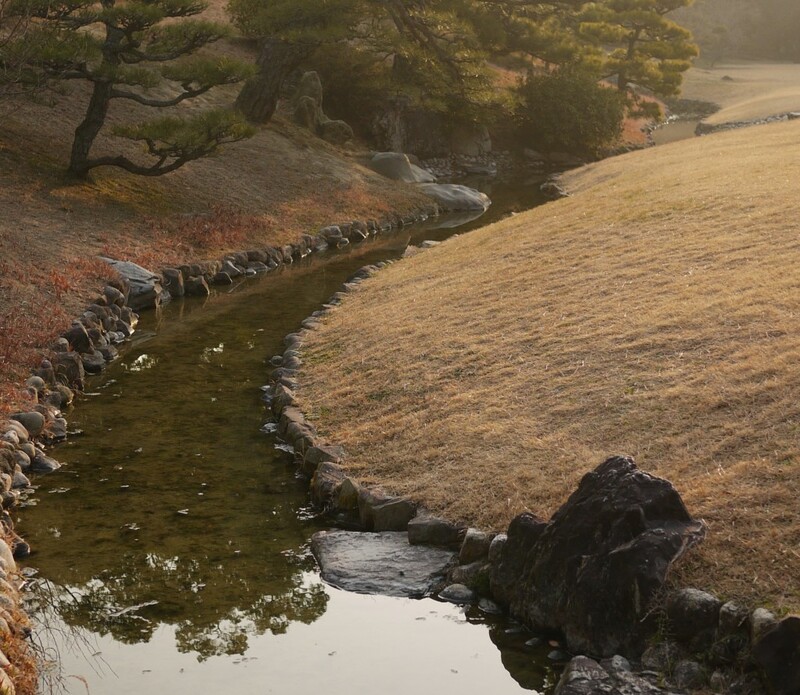 This entry was posted in Minimalism, Zen Buddhism on May 31 2012 by Jessica. If only we could be more like water – strong, life-giving and beautiful. It trickles and surges, ebbs and swirls, here and there, following the natural course of life without attachment or resistance. Even when it appears to be quite still, it is not stagnant but peaceful and content. And it is always always flowing. There are some weeks you’re busy, some weeks you’re bored. Sometimes you feel like working out, other times you feel like pigging out. Some days a friend or loved one can do no wrong, other days everything they do irks you. You can have an absolute favorite movie, song, food dish, book or hobby, but a few months later its being overplayed or you tire of it. One moment the sun is shining, the next it is raining. People are fickle, states are constantly changing, old things break, new things are invented. Things don’t simply move in just one direction – they can go backwards, forwards, left or right, up or down, and even in complete cycles. If we try to force things we cannot control to be one way or another, or if we insist on being at one extreme or another, then eventually we will lose our balance. This is okay sometimes too, but if we look for it, there is always a middle way. There is too much energy in the world for things to ever truly be still. It’s exactly these fluctuations and transitions that we experience every day that makes things exciting, keeps us on our toes and reminds us – if we remain mindful of it – that we are alive. 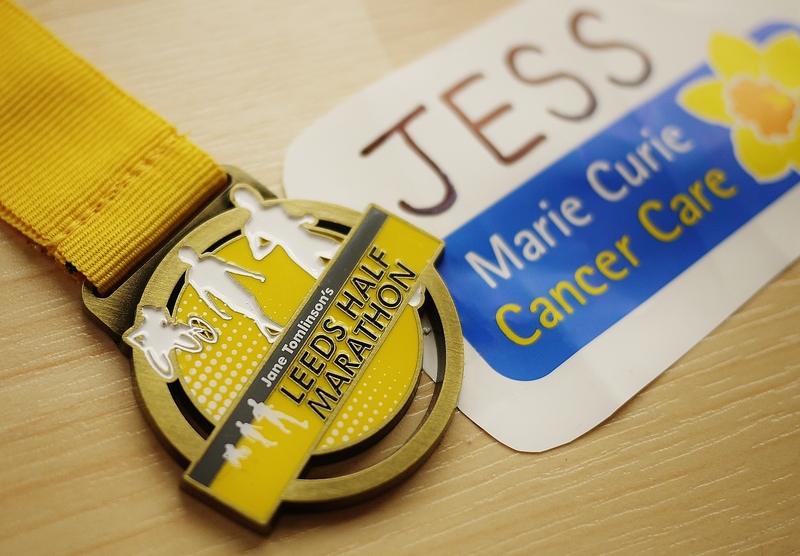 This entry was posted in Zen Buddhism on May 8 2012 by Jessica.